With southern Oklahoma winds starting to blow in, the sun is setting later and my thoughts are outdoors. 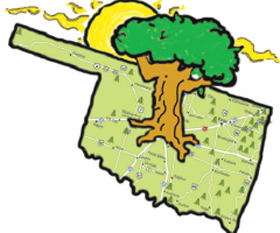 Oklahoma has beautiful outdoor spaces, and the Oklahoma City metro area is conveniently located near many of them. Here’s some of my favorite places to get outdoors near the city. Stinchcomb Wildlife Refuge, nestled in northwest Oklahoma City, is 1,000 acres of bliss. Winding through the large refuge is the North Canadian river, where nature lovers can observe beavers and other wildlife. The area is surrounded with lush trees, marshes, grasslands, and animals. The best part of all is that you don’t even have to leave the city to feel like you’re in the woods. If you have a bit more time consider visiting the Wichita Mountains Wildlife Refuge. To me, it is possibly the most beautiful place in Oklahoma. There is so much to do. Bike (or drive) three miles up to the peak of Mount Scott- at nearly 2500 ft elevation. From the top of the mountain you can see incredible views of the entire refuge. Take a hike through a dozen trails, or see some of the American bison herds in their natural habitat. The refuge is a drive though- about an hour and 45 minutes south on the H.E. Bailey Turnpike. Martin Nature Park is a great place to take a walk, especially if you have children. The trails aren’t very long so it is good for those who are short on time or energy. Dusk is my favorite time to take a walk through the park. It is located off W. Memorial Road and N. Meridian Avenue. On Oklahoma’s random cold days, (ie: snowing after one week of 70 degree weather) take a walk in the Crystal Bridge Tropical Conservatory in the downtown Oklahoma City Myriad Botanical Gardens. The Crystal Bridge is a huge greenhouse full of plants from all over the world. With a valid college ID, students can get in for $7. Oklahoma has so much to offer outdoors, so what are you waiting for?